The John Updike Childhood Home is a museum-in-progress that is owned by The John Updike Society, a 501 (c) 3 non-profit corporation organized for educational purposes. 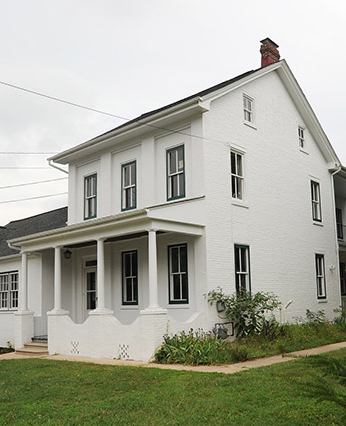 The house is located at 117 Philadelphia Avenue in Shillington, Pa., where author John Updike lived from “age zero” to 13, after which John and his parents moved to a farmhouse in Plowville that had been in his mother’s family. The purchase was made possible by a generous donation from the Robert and Adele Schiff Family Foundation, and the restoration is supported by the Robert and Adele Schiff Family Foundation, the PECO Foundation, the John and Gaye Patton Charitable Foundation, and individual donors. Updike treasured the house on Philadelphia Avenue because it was where his “artistic eggs were hatched.” Updike once remarked, “We have one home, the first . . . ” and he visited Shillington often during his career, going through the house as an adult on more than a few occasions and remarking that while most of the house was different, the attic remained unchanged from when he was a boy and used to play up there. Pictured is the front of the house. The two-story portion is original, while the single-story addition was added in 1950 by Dr. Hunter, who built the annex for his practice. The society remodeled the annex so that the three former examination rooms are now office space rented to David Ruoff Financial Alternatives, which is not affiliated with the society or childhood home. The former doctor’s waiting room has been repurposed as the society’s education room, and what used to be the doctor’s office/study will be a museum gift shop. During the restoration The John Updike Childhood Home has been open to tours by appointment only, but no tours are currently being given because of construction materials on site. The restoration is expected to be completed by October. 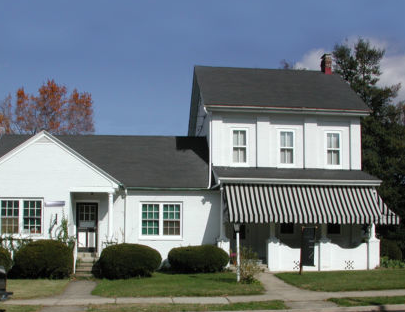 For more information and photos visit The John Updike Childhood Home website. Can’t wait to visit this museum when it opens. Any plans to buy the Plowville farm house? The Plowville farmhouse was rather suddenly and quietly sold to the Weaver family, whose orchard lies next to the property. Wow that’s really a very great news, waiting for the opening of the museum. Mrs. Hunter tells a delightful story about purchasing the home. John had painted fish on the wall going upstairs. She did not care for the wall art and said, “That is the first thing that has to go!” The wall art was painted over. Of course that was long before John became famous. You might want to talk to her and get the full story and description of the art. Our Wynonah Book Group (Schuylkill County) hopes to visit the home in the Spring. Any idea when it will be open for tours?